Stretching from Nha Phu Bay in the north to Nha Trang Bay in south, the wide coast of Khanh Hoa Province is dotted with numerous islands, with verdant forest, rich flora and fauna as well as marine life. Because of these natural treasures, one should not miss going island hopping in Nha Trang and experience what unspoiled nature truly means. Nowadays, since the tourism industry of Nha Trang has continuously flourished through the years, islands have been divided into northern and southern divisions to serve the travelers better. If you want a more exciting island hopping in Nha Trang, packed with different island attractions, then the southern section is the way to go. However, if you favor getting close to nature and being entertained by different island animals, the north islands are worth visiting. The Nha Phu Bay boat cruise is designed as a relaxing and ecological tour, which suits dynamic travelers and nature-lovers. Tourists are fetched from their hotel early in the morning and head to Cau Da Wharf, which is about 18 kilometers from the city centre, riding on a boat and cruising along Nha Phu Bay. The tour takes you to Thi Island, Orchid Stream Island and Lao Island respectively. Lao Island is the biggest island in Nha Phu Bay. It is also known as “Monkey Island” because of 1300 monkeys dwelling in the island. Enjoy the sight of tamed monkeys roaming freely and snap some photos. Tourists can also do scuba diving, bamboo raft racing, go-cart racing and horseback riding. The Thi Island covers 500 hectares of land, which features beautiful white sand beach lined by rugged cliffs for spectacular photo opportunities. The island is filled with exotic orchids, wild flowers and tropical fruit trees. You’ll also have a chance to feed animals such as deer and African ostriches. Close to Thi Island is Orchid Stream Island on Hon Heo Peninsula. Consisting of numerous brooks flowing from the rugged slopes of Mount Hon Heo, the streams flow gently throughout the island, stretching six kilometers. This wonderful place is part of the Hoa Lan Brook Tourist Park, where you can see a natural cave adorned with beautiful orchids. In fact, the cave is called “Cave of Orchid Flowers”, where over 3000 specimens of 39 orchid species gathered across Central and North Vietnam can be found. Exploring the southern part of Nha Trang offers an unforgettable experience with the different attractions present in Nha Trang Bay. One unique experience you should not miss when island hopping in Nha Trang bay is the glass-bottom boat. Before embarking on the boat, you have to first visit the Oceanographic Museum where a wide selection of marine creatures can be seen. Just near the museum, take the shuttle speedboat and be transported to Mun Island where the standby glass-bottom boat waits to take you around the island. 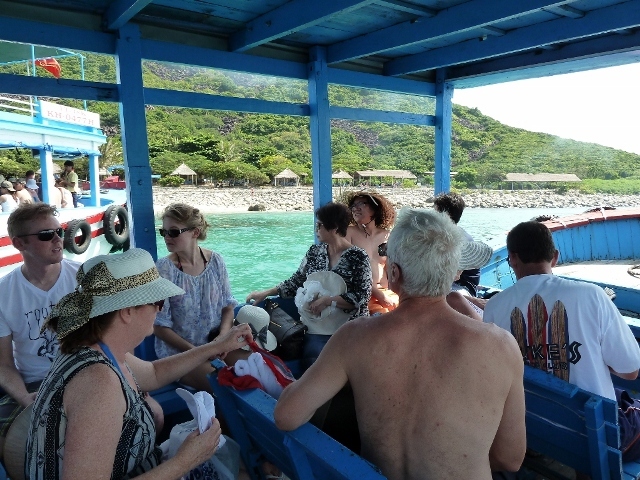 When circumnavigating the island, you can see the breathtaking coral reefs, various sea creatures and plants in Nha Trang Bay through the glass flooring of the boat. After cruising Mun Island, the boat will stopover at Dam Bay, which is southeast of Tre Island for a clear and clean beach. There are a number of restaurants in the place to take lunch. Tourists can even enjoy other water sports activities such as parasailing, jetskiing, kayaking and swimming after lunch. After this, the last island to visit is the Mieu Island (Bong Nguyen Island) where the famous Tri Nguyen Aquarium is located.